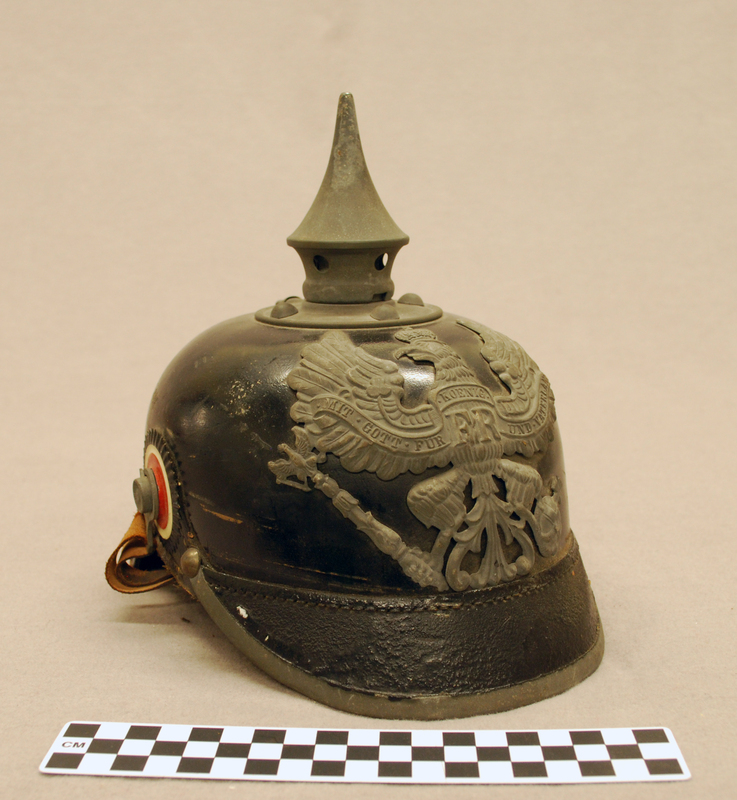 This helmet is a standard model Prussian pickelhaube, an iconic emblem of the Prussian Army and of Imperial Germany. The name roughly translates to pickaxe-bonnet (pickel meaning “pickaxe” and Haube meaning bonnet) and was worn by German soldiers, firefighters and police throughout the late 19th and early 20th centuries. The pickelhaube was originally designed and commissioned by King Friedrich Wilhelm IV of Prussia for standard use by Prussian troops in 1842. While it was a predominantly Prussian helmet, many of the other German states, such as Bavaria, Saxony and Mecklenburg, used their own versions of pickelhaube until it became standard issue for the United German Imperial Army after unification in 1871. The pickelhaube was constructed of steamed leather covered in many layers of black lacquer until it had a bright finish. A brass spine would be added to the rear of the helmet as well as a brass trim to the front visor. The iconic spike affixed to the top could be removed either to make the wearer less visible or to be replaced with a larger spike. The front of the helmet is covered with a gilded metal plate called a wappen. This helmet has the standard wappen, an imperial eagle with the words “Mitt Gott, fur Koenig und Vaterland” (With God, for King and Fatherland) written across it. The pickelhaube was phased out in late 1916 due to the fact that leather did little to stop bullets. It was to be replaced with the equally iconic M1916 Stahlhelm. While very few of them were ever likely to have worn a pickelhaube, a significant portion of the settlers that came to Texas were German. According to a 1990 census, 17.5 percent of Texas’ population claimed pure or partial German ancestry. The first wave of German settlers came in 1831, when Johann Friedrich Ernst and his family moved from Oldenburg. Ernst insisted that emigration would be a solution to the social, political, economic and religious issues that they faced in their homeland. He was granted 4,000 acres of land on what would become a belt of German settlements stretching from the Coastal Plain of Galveston to the Hill Country of Mason. Many of these first wave German immigrants were drawn to Texas by advertisements made by Ernst. The next major wave would come in the 1840’s because of the efforts of the Adelsverein (Society for the Protection of German Immigrants in Texas). The Adelsverein was an organization founded by a group of German nobles that aimed to make a Texan colony of German peasant farmers. They believed that in doing so they would both alleviate rural overpopulation in Germany and benefit financially. Although bankruptcy prevented their final goals from being accomplished, the Adelsverein aided in the transportation of more than 7,000 Germans to Texas between 1844 and 1847. These groups of German immigrants founded the towns of New Braunfels, Fredericksburg, and Boerne. The following video discusses Wurstfest. Great Britain, and Imperial War Museum (Great Britain). 1996. Handbook of the German Army in war, April 1918. London: Imperial War Museum, Dept. of Printed Books. Jordan, Terry. Germans: The Handbook of Texas Online. Texas State Historical Association. Long, Christopher. King William Historic District: The Handbook of Texas Online. Texas State Historical Association. Meredith, Hugh. Ernst, Johann Friedrich: The Handbook of Texas Online. Texas State Historical Association. Reiley, Ralph. 1997 The German Pickelhaulbe, 1914-1916.